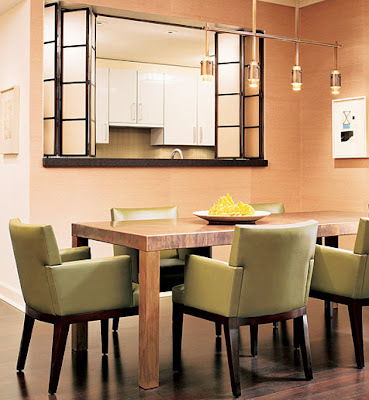 A Manhattan couple turned to Paul Vincent Wiseman’s firm, The Wiseman Group, to design their secondary residence in San Francisco. 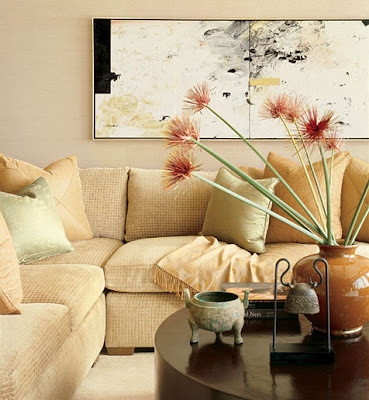 Wiseman and senior designer Judy McBride kept the living room clutter-free to accommodate visiting grandchildren. The wife found the Chinese figures, from the Han Dynasty, in a New York shop. McGuire rattan lounge chair. “It’s warm and serene,” McBride says of the living room, which features an oil by Robert Ogata. Sofa fabric, Cowtan & Tout. Corner pillow fabric, Clarence House. Green pillow silk, Donghia. Hokanson carpet. McGuire low table. The designers continued the “simple, slightly Asian aesthetic” with translucent screens that separate the kitchen from the dining area. The collage is by Dennis Parante. Holly Hunt chairs, with Edelman leather. Poggenpohl cabinets. Wood-paneled doors connect the den and the master bedroom. Edelman leather on lounge chair and ottoman. Kano school screen in den, Naga Antiques. Henry Calvin sofa fabric. Glant floral on pillows. Diverse art offsets the consistent theme of the rooms. A work by Jessica Martin hangs above the bed. Atop the dresser are 12th-century Cambodian bronze mirrors, a Manuel Neri maquette and a photograph by Jess Johnston. Larsen fabric on bed frame.